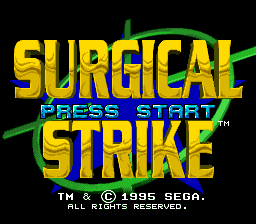 Surgical Strike (サージカルストライク) is a Sega Mega-CD game developed by Code Monkeys and published by Sega. The game is interesting as it was due to be brought to the Sega Mega-CD 32X combo unit, but was said to have been cancelled at the last minute (the US Mega-CD version of the game even goes as far to advertise the 32X upgrade). While this is true for North America, Europe and Japan, the CD 32X game did see a release in Brazil, making it the only 32X Brazilian exclusive (although the game itself is still in English). This was also the last first party release for the Japanese Mega-CD. Surgical Strike is a full motion video game where the objective is simply to move a targeting redicule and fire either your gattling gun or missiles at specified targets before they "shoot" back. SPACECAM Aerial Camera System provided by: SPACECAM SYSTEMS, INC.
Main article: Surgical Strike/Magazine articles.